​Compare Vacuuming Robots Haier XShuai C3 and XShuai T370: Which is better? If you're considering getting a Haier floor cleaning robot, you may find this article useful in helping you with selecting the right Haier for your home. Note that Haier has produced a number of vacuuming and mopping robots, and therefore, to simplify your task of choosing the right robot for your needs, we will only consider the most popular and best rated ones bought by Amazon customers. At the time of this writing, the most popular and best rated Haier robots in the vacuuming & mopping category were Haier XShuai C3 and Haier XShuai T370. This article will compare in detail these two robots. This article will compare Haier XShuai C3 and Haier XShuai T370 vacuuming robots. These were not just the most popular Haier vacuuming and mopping robots among Amazon customers at the time this article was written, but they had also received excellent reviews from most Amazon buyers (an average of at least 4 stars each out of 5 stars!). Haier XShuai Vacuuming Robots on Amazon. The 3.54-inch thickness (height) of both robots allows cleaning with ease under low lying furniture. Both robots use the world-famous Epson gyroscope to navigate the robot. These robots can calculate the room area and memorize the room layout, which makes them hardly ever miss any area or corner while cleaning. XShuai C3 is equipped with a built-in camera, speakers and a microphone. So, when your smartphone is connected via Wi-Fi to the robot from wherever you may be, you can access your home, see what the robot's camera sees, and talk with whoever might be around the robot. This is an awesome capability, because you can see what's going on at home, and if you have kids or pets you can keep taps on them, hear them, and even talk to them. For extra privacy, the robot uses P2P technology to transmit the image without no cloud involved. The anti-collision infrared mechanical sensor ensures that the robot will not bump into your delicate furniture. The embedded anti-drop sensor can detect stairs and steps, and it will make the robot change its direction in order to avoid falling. Haier XShuai C3 is equipped with a rolling brush that is able to grab and break dirt and debris that are hard to clean. The rolling brush is great for cleaning short-hair carpets. Haier XShuai T370 does not have a rolling brush. The vacuuming is done with direct powerful suction. Direct suction is great for cleaning pet hair and other debris from hard floors. With XShuai C3, it is possible to switch easily between using the rolling brush and the suction port. The rolling brush is great for carpets, while the direct suction is great for hard floors and flat surfaces. Both robots are equipped with double side brushes which are great for cleaning corners and wall edges. These two robots are great for hard floors and short-hair carpets. As long as the thickness of the carpets do not exceed 1 cm, they will successfully transition from hard floors to carpets. The large wheels these two robots are equipped with are specially designed to work on rough floors. They can also steadily climb up to a 15-degree slope. But of course, XShuai C3 is to be expected to perform better than XShuai T370 on the carpets because of the rolling brush it is equipped with. Both robots can be scheduled to clean on the day and time of your choice. Scheduling is done using the free Huiba App. Both robots will automatically sense when battery is low and will go to charging station to dock and recharge. Both robots robot come with a removable thin water tank and a mopping pad that can be used to sweep and mop at the same time. The water is released slowly to the mopping pad under the tank for better cleaning of flat surfaces & hardwood floors. The pad is detachable, so it can be tossed in the washing machine to be cleaned. The water tank capacity is 100ml for XShuai C3 and 300ml for XShuai T370. Automatic cleaning: The robot follows a cleaning route according to the home layout. S-shaped cleaning: The most efficient cleaning route, cleans the room without repetition or omission. Spot cleaning: The robot spins around the center of the area to be spot cleaned in spiral way. Edge cleaning: The robot cleans along the walls. XShuai C3 is equipped with a Nidec, 12000 rev/min, brushless motor that features long lifespan, low noise and offers 1000 Pa suction. XShuai T370 is equipped with a Nidec, 16500 rev/min, brushless motor that features long lifespan, low noise and offers 1500 Pa suction. Both motors are low noise and have ultra-long lifespan due to their zero-friction system. Home button to send the robot to the charging station. All other functions are invoked from the Huiba App. Clean button for auto cleaning. Spot button for spot cleaning. Plan button to plan the area to be cleaned. Both robots are equipped with high-efficiency HEPA filters which can capture 99.97% of allergens, including dust, pet dander, dust mites, mold and pollen. Both robots are equipped with a 14.8V 2600mAh Lithium-Ion battery. The average cleaning time they provide is about 120 min (this number can change based on the floor type, floor layout, amount of dirt, etc.). Both robots support Wi-Fi. Therefore, when they are connected via Wi-Fi to your smartphone, you can use the Huiba App for Android and iOS to invoke remotely operations (such as cleaning mode selection, scheduling, etc.) from wherever you are, using your smartphone. The App supports the following languages: English, German, French, Italian, Spanish, Japanese, Russian, Korean, Hebrew and Portuguese. You can use Amazon Alexa or Apple Siri to remotely control these robots with your voice. You can use the Remote-Control device to select the cleaning mode, to control the robot's movement & direction. to schedule the robot, to send it to the charging station, etc. So which of the two robots to buy? XShuai C3 is equipped with a rolling brush while XShuai T370 uses direct suction. This means that, if you have carpets, you would probably be better off getting the XShuai C3. On the other hand, if you have only hard floors, both robots will do fine; but remember that XShuai T370 has more suction power than the XShuai C3 (1500 Pa vs. 1000 Pa). ​XShuai C3 is equipped with a built-in camera, speakers and a microphone. So, when your smartphone is connected via Wi-Fi to the robot from wherever you may be, you can access your home, see what the robot's camera sees, and talk with whoever might be around the robot. This allows you to keep taps on your family and pets, hear them, and even talk to them. ​You will find below, Amazon links for both robots which you can click for exact price information or to purchase. 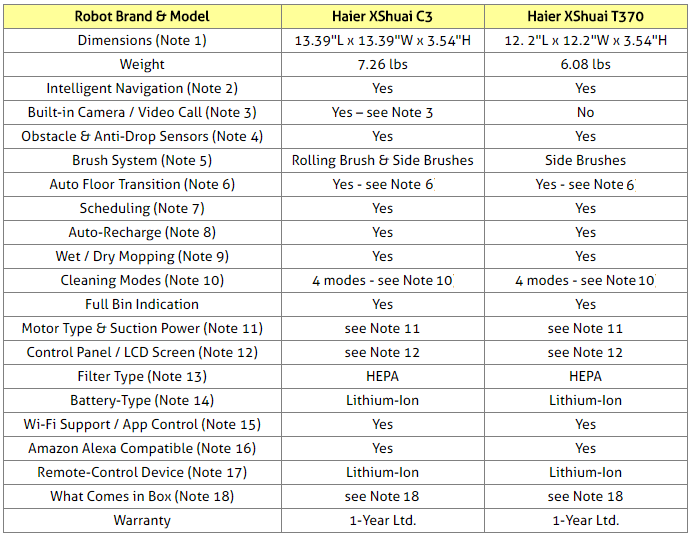 Note: Both the HAIER XShuai C3 and the HoLife robots are offered below. The two robots are functionally and physically identical.